Chapter 57 – Will You Get Sudden Wealth? The eighth house is one of the inauspicious houses in the chart. It represents accidents, death, buried things, secret, black money etc. When the second house lord is favorably placed in eighth house, the native gets wealth due to accidents, death, buried things (Treasure) etc. But if unfavorably placed, the native may end up with sudden loss of wealth. The second lord Venus will be in Scorpio. This is enemy sign to Venus. 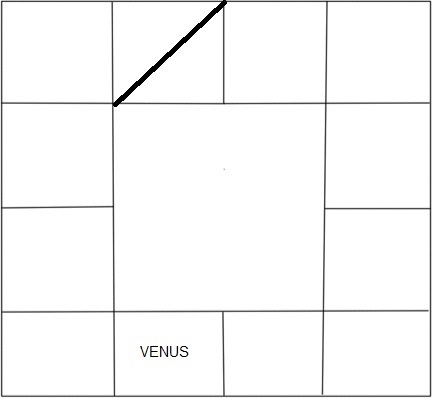 But Venus aspects the second house from eighth house. So, it brings longevity and good wealth to the native. Being lord of powerful pathaka sthana, placed in eighth house, will reduce the evil effect of being lord of pathaka sthana. But since Venus is significator of marriage, it may delay the marriage of the native. 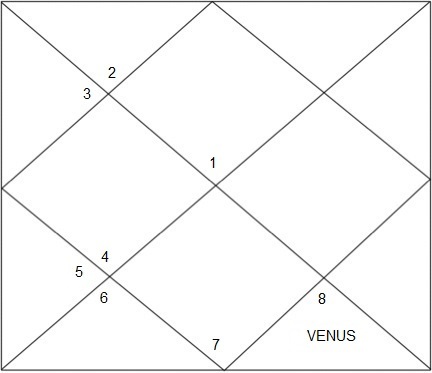 If Venus is placed in 3rd quarter of Anuradha/Anusham nakshatra or 4th quarter of Jyeshta/Kettai nakshatra, better results are expected. But if placed in 2nd quarter of Anuradha/Anusham nakshatra, good results will be reduced. The second lord Mercury will be in Sagittarius. This is neutral house to Mercury. But Mercury is friendly to the ascendant lord Venus. So, it gives good results in its dasa period. The native gets sudden wealth from his maternal uncle relations. If Mercury is placed in 3rdquarter of Moola nakshatra or 2nd quarter of Purva Ashada/Puradam nakshatra, better results are expected. The second lord Moon will be in Capricorn. This is neutral house to the native. Moon in eighth house makes the native indecisive and oscillation of mind. But the native’s speech will be attractive. The native my get wealth from his mother as a heir of properties. If Moon is placed in 2nd /4th quarter of Sravana/Thiruvonam nakshatra, better results are expected. The second lord Sun will be in Aquarius. This is neutral sign to Sun. The native may lose his father at young age and gets property as heir. Native’s father may not be helpful to him. Since Sun aspects the second house, it may cause eye disease to the native. But brings good wealth. If Sun is placed in 1stquarter of Purva Bhadrapada/Poorattathi nakshatra, better results are expected. But if placed in 3rd quarter of Dhanishta/Avittam nakshatra, good results will be reduced. The second lord Mercury will be in Pisces. This is debilitation sign for Mercury. So, the native may not get wealth in his life. He may end up with great loss in his business. The native must be careful in investments. If Mercury is placed in 2nd quarter of Uttara Bhadrapada/Uththirattathi nakshatra, better results are expected. But if placed in 4th quarter of Revathi nakshatra, good results will be reduced. The second lord Venus will be in Aries. This is neutral sign to Venus. Since Venus is significator of marriage, it may delay the marriage of the native. Venus, the natural benefic in eighth house gives good longevity to the native. If Venus is placed in 2ndquarter of Ashwini nakshatra or 3rd quarter of Bharani nakshatra, better results are expected. But if placed in 2nd quarter of Bharani nakshatra, good results will be reduced. The second lord Mars will be in Taurus. This is enemy sign to Mars. Mars in eighth house creates lots of problems to the native. It brings sudden accidents to the native. He may lose his spouse at a very young age. The native must be careful in investments. If Mars is placed in 2nd quarter of Kritika nakshatra or 1st quarter of Rohini nakshatra, better results are expected. But if placed in 4thquarter of Rohini nakshatra, good results will be reduced. The second lord Jupiter will be in Gemini. This is enemy house to Jupiter. The natural benefic Jupiter in eighth place gives good longevity to the naïve. But the native may be issue less or may have delayed child birth. The native must be careful in investments, particularly with private financial institutions. If Jupiter is placed in 1st / 4thquarter of Ardra/Thiruvathirai nakshatra, better results are expected. But if placed in 2nd quarter pf Ardra/Thiruvathirai nakshatra, good results will be reduced. The second lord Saturn will be in Cancer. This is enemy sign to Saturn. Saturn in eighth house gives good longevity to the native. This is exception for the karako bhava nasthi concept. Though Saturn is the significator for longevity, it is exempted. But financially the native may not be sound. If Saturn is placed in 3rd quarter of Pushya/Pusam nakshatra or 2nd/3rd quarter of Ashlesha/Ayilyam nakshatra, better results are expected. The second lord Saturn will be in Leo. This is enemy sign to Saturn. Saturn is ascendant lord too. So, this placement is not favorable to the native. It creates lots of obstacles in native’’s life. The native may not have good relationship with this father. Saturn in eighth house gives good longevity to the native. If Saturn is placed in 3rd quarter of Phalguni/Puram nakshatra nakshatra, better results are expected. But if placed in 1stquarter of Magha nakshatra, good results will be reduced. The second lord Jupiter will be in Virgo. This is enemy house to Jupiter. The natural benefic Jupiter in eighth place gives good longevity to the naïve. But the native may be issue less or may have delayed child birth. The native must be careful in investments, particularly with private financial institutions. If Jupiter is placed in 4thquarter of Uttara Phalguni/Uththram or 4th quarter of Hastha nakshatra, better results are expected. But if placed in 2nd quarter of Uttara Phalguni/Uththram nakshatra, good results will be reduced. The second lord Mars will be in Libra. This is neutral house to Mars. Mars in eighth house creates lots of problems to the native. It brings sudden accidents to the native. He may lose his spouse at a very young age. The native must be careful in investments. If Mars is placed in 4th quarter of Chitra nakshatra or 2nd quarter of Swathi nakshatra or 1st quarter of Vishaka nakshatra, better results are expected. ← Chapter 56 – Will You Become Rich After Marriage?